It’s Monday morning and you’re at work listening to a fellow co-worker talking about his weekend warrior move of completing a marathon and you begin to think, “hmm, I want to try a marathon” and suddenly your head is spinning with the how, why and what do I need of the running world. Before he can pull out his medal to show everyone, you’re already in your cube googling “running store locations”. As google begins listing out your 14 local running stores within a 20 mile radius of your location, you start wondering, “How do I decide? They all are basically the same right?” Wrong! Let’s dive into the Fleet Feet Sports difference. Hang with me because it’s about to get runner nerdy in here! I haven’t always worked at Fleet Feet Sports, but I have been a runner who needed shoes and wondered if getting “Fit” really made a difference. The answer as many of you know or will find out is, yes it does make a huge difference. It also makes a difference where you get fit. Before I worked at Fleet Feet, I decided to run my first 5k and needed shoes. I went to a couple of different places looking and then was referred to a store that had a “fitting” process. Excited to embark on this new challenge for myself, I headed over to the running shop to ask a million questions to the all-knowing runners at the running store and to have my perfect running shoe bestowed upon me. Walking into the store, I was greeted and welcomed and quickly asked what I could be helped with? I told them I was getting ready to run my first 5k and that I needed a pair of shoes to train and race in. Before I could even finish my sentence I was being lead to the other side of the store. I wasn’t sure what was happening or if someone in a hockey mask was waiting over there! That’s a bit exaggerated, but a little more than “follow me” would have been helpful. As we arrived to a treadmill I was ordered to hop on and that I would be filmed and this would tell them what shoes I needed. Feeling like I had no choice but to follow orders, I hopped on the treadmill and it started to move into motion. I began to jog along, wondering what they were seeing or if anyone was watching back there. The treadmill began to slow and the sales associate from behind said “great job, go ahead and have a seat over there and I will grab you a pair of shoes.” Over where?? There are chairs everywhere. So I sat wondering how this guy even knew what size shoe I wore? At this point my mind was already made up, I’m uncomfortable. As he came back with “my” shoe, I asked him how he knew what size I was. He said he could tell I was probably about a 7.5. Shaking my head I thought “wrong, I’m at least a size 8.5. Now let’s fast forward to the Fleet Feet Sports experience. As I said in the beginning, not all running stores are created equal. When I walked into my first Fleet Feet Sports, I was greeted just like before and asked what I could be helped with. As I told them what my goals were, the older man that helped me asked if I had ever been to a Fleet Feet before. I replied with no, and he began to tell me a little bit about their fitting process. After he finished he asked if I was interested in being “Fit”. Already feeling so much more comfortable, he asked me to follow him over to the fitting area where we would begin my gait analysis. He began to explain the fitting process a little more in-depth as I was removing my shoes and socks and cuffing my pants. After walking barefoot a couple times so he could watch my feet and ankles, he measured my feet and began asking about any injuries I had and if I was prone to any. After he finished measuring my feet and going over everything he had seen, I admit he used terms that were foreign to me and I was a Personal Trainer and knew anatomy like the back of my hand! I was really impressed with his knowledge and ability to explain it after I admitted sheepishly I wasn’t sure what he was talking about. Returning with my shoes, we began to try them on and he would take me outside and watch me run in each pair. I was completely blown away by the attention, knowledge and ability to allow me to better understand why things were feeling the way they were and how to adjust little things to make my stride more efficient. After helping me decide on the shoe that felt the best, he gave me some final advice about training for my race. Needless to say, they earned a customer for life I was so impressed. Skip ahead a few years, because of that impression he made in showing me the difference in true professional customer service and making me feel like more than a potential dollar sign, I now work for Fleet Feet Sports. And THAT’s the Fleet Feet Sports difference. Not only is the mission to help you find the right running shoe, but to also help guide you into a more active and healthy lifestyle. You will come for the Fit Process, but leave with education, experience and a new place to go for advice. Fleet Feet Sports - It moves people together. It ignites hearts and inspires emotion. And that emotion turns into motion. That motion is turning out to be a movement. 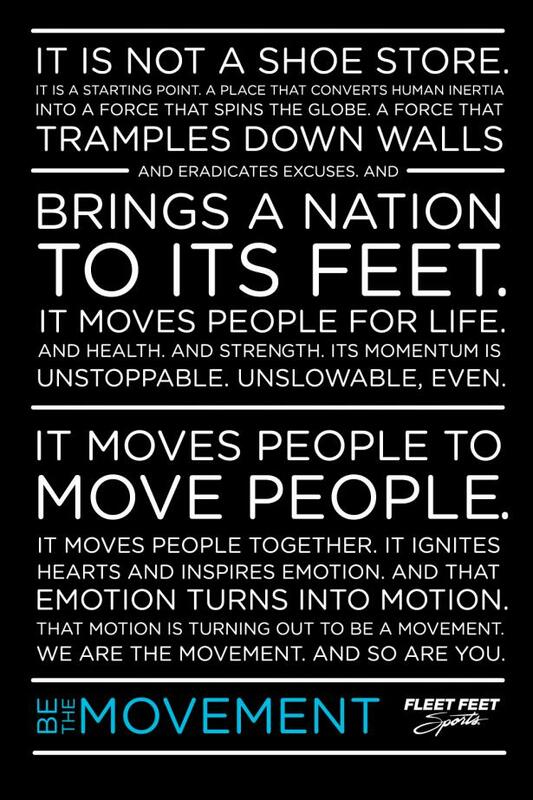 WE ARE THE MOVEMENT. AND SO ARE YOU.